Citing influences such as the Jam, the Clash, and the Smiths, the Arctic Monkeys create a vibrant punk-inspired sound well suited for Britpop and alternative rock fans alike. 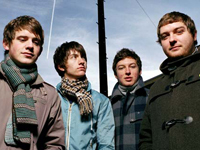 Alex Turner (vocals/guitar), Jamie Cook (guitar), Andy Nicholson (bass), and Matt Helders (drums) formed the Arctic Monkeys in Sheffield, England, in 2003. A year prior, Turner and Cook received guitars for Christmas. From there, these teenagers made practicing an obsession, memorizing hits by the White Stripes and the Vines. A deal with Domino, the label home to Franz Ferdinand and Clinic, followed in spring 2004. Rambunctious first single “I Bet You Look Good on the Dancefloor” debuted at number one on the U.K. singles chart in October 2005. Their debut album, Whatever People Say I Am, That’s What I’m Not, was issued in January 2006; within a day of its release, the album sold 118,501 copies in the U.K. — and over 350,000 its first week — setting a record for more records sold than the rest of the Top 20 album chart combined. In America, the album scraped the bottom of the Top 40. The Arctic Monkeys wasted no time releasing new material, and that spring the EP Who the F**k Are Arctic Monkeys appeared. 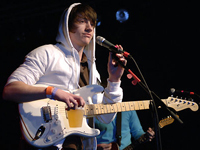 On their first North American tour, bassist Andy Nicholson sat out due to fatigue. Nick O’Malley temporarily stepped in to play the tour, and when the band announced that Nicholson was out of the group in June 2006, O’Malley was ultimately named a permanent member.